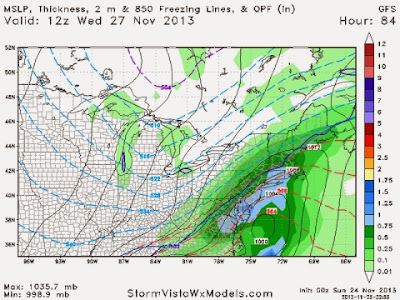 The coastal storm for Thanksgiving Eve is starting to get back into agreement on model guidance in terms of detail. There are still some differences between the GFS and EURO over track and at this point, given the level of cold and warmth that will be around on both sides of the storm system, those differences do matter quite a bit. 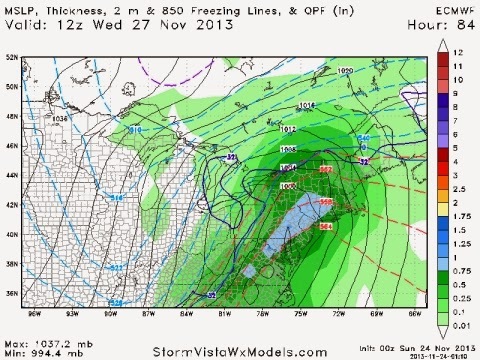 First, let's lay out timing -- this storm will impact the region on Tuesday night into Wednesday. Tuesday will feature clouds increasing, with rain moving in on Tuesday evening in Philadelphia. The bulk of heavy rain is late Tuesday night, early Wednesday, with precipitation winding down Wednesday afternoon (depending on model, the Euro holds lingering precipitation into Wednesday evening). For Philadelphia and points east, this is a rain storm. Perhaps heavy rain at times. Could be a "warm" rain for a few spots as temperatures could reach 60 along the Shore and just inland, perhaps even to Philadelphia. Regardless, rainfall amounts should reach or exceed one to two inches along and just east of the low track, much of it falling in a short period of time. Despite the level of dry weather we've experienced this autumn, this level of rainfall as quickly as it may fall will yield some problems in the usual suspect streams and roads that tend to get ponding of water easily. 1) How far west does the mild surge get? The Euro (west of Philadelphia) and GFS (coast) keep a decent line of separation at this point on just how far that surge of warmth gets. The GFS has shifted in track over the last few runs farther to the west, which yields the possibility of further shifts west towards a relatively consistent Euro (which has maintained a low track generally along or just west of I-95 for the past couple of runs). How far west the low tracks determines a lot of factors -- temperatures, where the heaviest rain falls, and even precipitation type. 2) Wintry precipitation? As of now, modeling suggests that wintry precipitation falls west and northwest of I-95. The Euro is farther northwest and west (Central Pennsylvania mountains) with the shield of snow, where the GFS suggests a bit farther east (generally I-81 and west but even some wintry precip into Allentown, Reading, Lancaster). In terms of precipitation type...snow for many but some freezing rain and sleet cannot be ruled out in spots as well, especially along the transition zone if some of the modeling out there is right. The GFS, in particular, has been aggressively painting a zone of freezing rain and sleet between the snow shield and rain...and this zone on the GFS gets into the western and northwestern burbs. IF the GFS is right, track will matter quite a bit for Wednesday morning's commute along Route 222 and points west where that zone of frozen rain or sleet could set up. The GFS is the colder model at this point -- but, remember, it has nudged its track farther west as a trend over the last day or so so it's possible further shifts could take place. 3) Other impacts? Travel will be the biggest -- regardless of track and intensity, flight delays and cancellations are likely on Wednesday along the East Coast but those impacts are being felt now as the storm slides through Texas and the Deep South as flights to and from those regions are being impacted.